Another day, another top 10 list from Gartner, which this week is playing host to 10,000 IT pro at the Gartner Symposium IT Expo in Orlando. 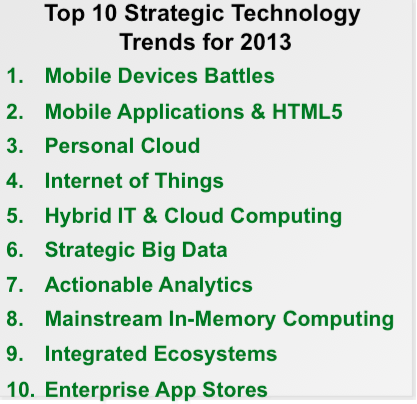 Today, Gartner took a look at a little closer in, providing a list of the “Top 10 Strategic Technology Trends for 2013. You can see the list in the box at right. Mobile device battles: Mobile experiences eclipse the desktop experience. Consumerization drives tablets into the enterprise. Cloud and mobile are mutually reinforcing trends. Bring your own device trend accelerates. In 2013, mobile devices will pass PCs to be most common Web access tools. By 2015, over 80% of handsets in mature markets will be smart phones. 20% of those will be Windows phones. By 2015, tablet shipments will be 50% of laptop shipments, with Windows 8 in third place behindApple and Android. Microsoft‘s share of overall client platform will fall to 60%, and could drop below 50%. In smartphones, Windows could pass RIM to be #3 player, and could be same size as Apple in units by 2015. Windows 8 will be “relatively niche,” with mostly appealing to enterprise buyers. Personal Cloud: Cloud will be center of digital lives, for apps, content and preferences. Sync across devices. Services become more important; devices become less important. Internet of Things: Internet of things is already here. Over 50% of Internet connections are things. In 2011, over 15 billion things on the Web, with 50 billion+ intermittent connections. By 2020, over 30 billion connected things, with over 200 billion with intermittent connections. Key technologies here include embedded sensors, image recognition and NFC. By 2015, in more than 70% of enterprises, a single exec will oversee all Internet connected things. Becomes the Internet of Everything. Hybrid IT and Cloud Computing: Changes role of IT. IT departments must play more roles in coordinating IT related activities. Strategic Big Data: Organizations need to focus on non-traditional data types and externa data sources. Hadoop and NoSQL gain momentum. Big data will meet social. Five richest big data sources on the Web include social graph, intent graph, consumption graph, interest graph and mobile graph. Concept of single corporate data warehouse is dead. Multiple systems need to be tied together. Actionable Analytics: Cloud, packaged analytics and big data accelerates in 2013, 2014. Can now perform analytics and simulation on every action taken in business. Mobile devices will have access to the data, supporting business decision making. Mainstream In-Memory Computing: Changes expectations, designs and architectures. Can boost performance and response times. Enables real-time self service business intelligence. SAP and others will accelerate delivery of applications in 2012/2013 to leverage in memory capability. Integrated Ecosystems: More packaging of software and services to address infrastructure or application workload. There will be more shipment of “appliances,” with software delivered as hardware. New trend: virtual appliances, which Gartner sees gaining in popularity over the next five years. Enterprise App Stores: By 2014, there will be more than 70 billion mobile app downloads from app stores every year. Also by 2014, most organizations will deliver mobile apps to workers via private application stores.